DON’T SNITCH: Don Jr. to be back on Capitol Hill for SECOND interrogation! Former White House security advisor Mike Flynn pleaded guilty to lying to the FBI about his transition contacts with Russia’s ambassador to the U.S.
Donald Trump Jr. will get grilled by House Intelligence Committee members about his Russia contacts Wednesday, just days after the guilty plea of former White House national security advisor Mike Flynn. 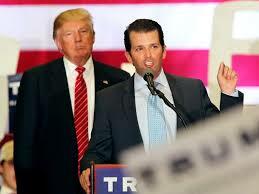 The voluntary appearance by the president’s eldest son takes place behind closed doors, and follows an earlier closed meeting Trump Jr. had with a Senate committee. Panel members are planning to quiz him on his June 2016 meeting with Kremlin-linked lawyer Natalia Veselnitskaya. The person who helped set up that meeting, British music publicist Rob Goldstone, is scheduled to speak to the committee next week. The meeting took place after the promise of dirt on Trump rival Hillary Clinton. Veselnitskaya said in written responses to the Senate Judiciary Committee that at the meeting Trump Jr. asked her for information on any illegal donations to the Clinton Foundation at the meeting, NBC News reported. ‘”Today, I understand why it took place to begin with and why it ended so quickly with a feeling of mutual disappointment and time wasted,” Veselnitskaya wrote. “The answer lies in the roguish letters of Mr. Goldstone,’ she wrote. She said in her 51-page letter she didn’t work for the Russian government and was not carrying a message from Russia during the meeting, and claims she was there to lobby against the U.S. Magnitsky Act, which slaps sanctions on Russian officials. Trump Jr. asked her directly for the incriminating information, according to her answers. ‘Now that I know the kind of apocalyptic Hollywood scenario that a private conversation between a lawyer and a businessman can be turned into, I very much regret that the desire to bring the truth to the [Congress] has thrown the U.S. president’s family, as well as Mrs. Clinton, into the whirlwind of mutual political accusations and fueled the fire of the morbid, completely groundless hatred for Russia,’ she wrote. Trump Jr. will also face questions on communications with WikiLeaks. He publicly released his text communications with the group’s founder, Julian Assange, after their existence was revealed. Some of Assange’s outreach went unanswered. But in once case, he asked Trump Jr. to share a link about emails presumed to be hacked from Clinton campaign chair John Podesta’s email account, and Trump Jr. did so. The U.S. Intelligence Community has concluded that the Democratic emails posted on WikiLeaks were hacked as part of an election meddling strategy driven by the Russian government. Trump Jr. met with Senate Judiciary Committee members in September for five hours. He also plans to meet with staff for the Senate Intelligence Committee, which is conducting its own probe.